Based on examples from the Royal Armouries at Leeds. Made from polyeurethane with a shore hardness of 85. Available in matt grey finish, other colours such as silver, gold, red etc available on request. The coronels have undergone extensive testing with the C15th Jousting Group Destrier in the UK and are now used at the Royal Armouries Easter Jousts as well as Arundel International Jousting Tournament and other events worldwide. 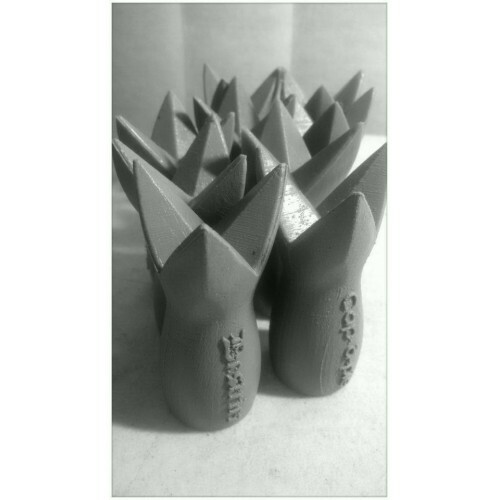 Each Coronel weighs approximately 71grams with a 30mm socket. Other Socket sizes can be made, contact for further information. Custom text is also available for an additional cost. Contact us for further details. Please note - these are currently being made to order and generally take between 7-10 days. Contact us if time critical. Do you have any questions about Jousting Coronels 30mm Socket? Based on examples from the Royal Armouries at Leeds. Made from polyeurethane with a shore hardness o..